By the light of the candlefish — Margo Pfeiff explores ancient traditions still very much alive. Margo Pfeiff explores the ancient, and living, relationship between First Nations and fish runs in B.C. The Adams River is running red. 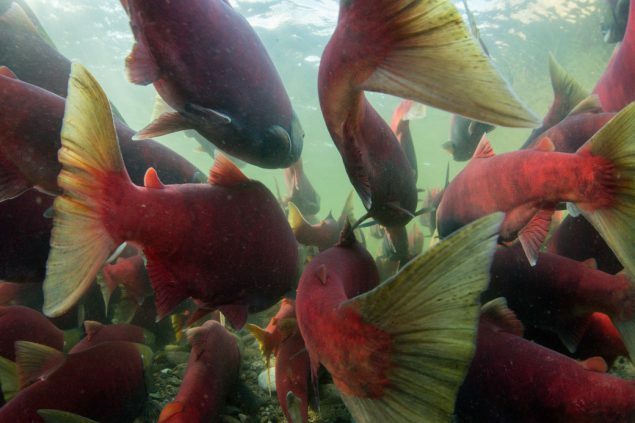 Thrashing through the shallows, millions of ruby-coloured Sockeye salmon battle upstream on the final leg of a four-year, 4,000-kilometre round trip that will bring them back uncannily close to their own birthplace by using smell and an internal GPS. Each female will then lay roughly 4,000 eggs and die; only one of her eggs will manage to return to this very spot in four years as a spawning adult. That salmon run I experienced as a young teen on vacation with my parents near Shuswap Lake in British Columbia’s interior was moving, mysterious and magical — so unexpectedly emotional, I never forgot it. Watching that heartrending struggle for life, it’s no wonder First Nations people in British Columbia consider salmon not only a vital food source, but also a sacred creature. Some even believe these fish to be returning relatives. A keystone of Aboriginal culture, salmon figure prominently in legends, art, songs and ceremonies. Their life cycle has long been well understood. They were always treated with the respect of a fellow being and were harvested sustainably for millennia. The same is true of two other major fish runs in B.C., that of the herring off the West Coast, and that of an amazing little fish up north called the eulachon —a fish that is so oily it can be lit like a candle when dried! Since Europeans began emptying the seas with little regard for the complex web connecting all creatures that is so integral to First Nations’ survival, the numbers of all these fish have plummeted. Today, Indigenous people find themselves fighting not only for their own rights, but also for those of the creatures that helped sustain them to this day, since strong connections with traditional foods are not a thing of the past. 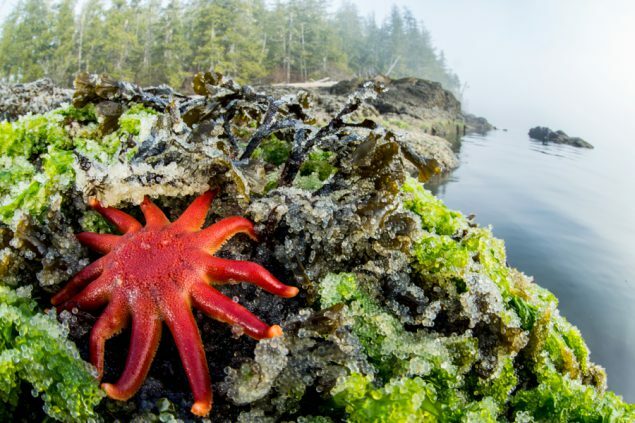 For example, it’s been reported that Vancouver Island First Nations eat an average of 60 kilograms of seafood annually, 15 times the Canadian average. Ninety per cent of that seafood is harvested locally, not purchased at grocery stores. Salmon is B.C.’s iconic fish and there are five species: Chinook, Coho, Chum, Sockeye and Pink. It is the only one of the trio of fish runs found in oceans, rivers and lakes. The Secwepemc people of the Adams River region fish for salmon about 500 kilometres inland after the fish have migrated up from the coast via the Fraser and Thompson Rivers over the course of about 17 days. 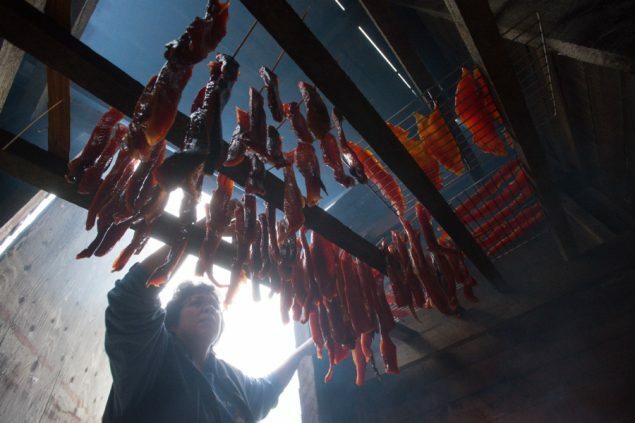 Dried or smoked for winter storage, salmon are so important to the Secwepemc that moons at certain times of the year as well as months are named after them. 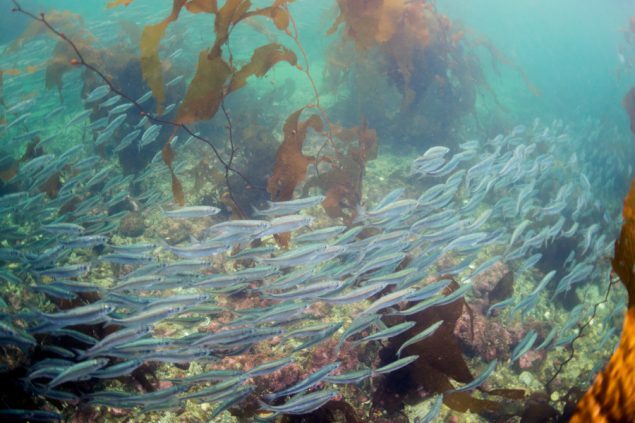 Salmon may be ubiquitous, but historically, herring off B.C.’s coast was by far the most abundant fishery — bigger than all the salmon runs combined and an essential link in the marine food chain. 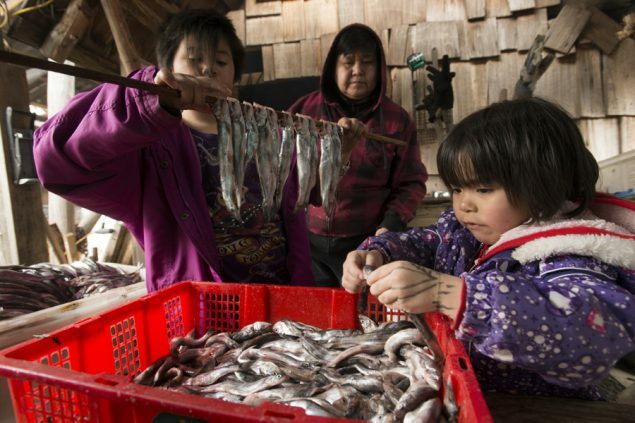 “They were a staple for us, so plentiful we scooped them up with herring rakes,” says Harvey Humchitt, a hereditary chief of the Heiltsuk Nation in Bella Bella. From mid-March to late April stretches of shallow waters, kilometres long, become milky white with milt, fish and eggs deposited mostly onto kelp and eel grass. The skies fill with gulls and the waters teem with seals, sea lions and feeding whales. 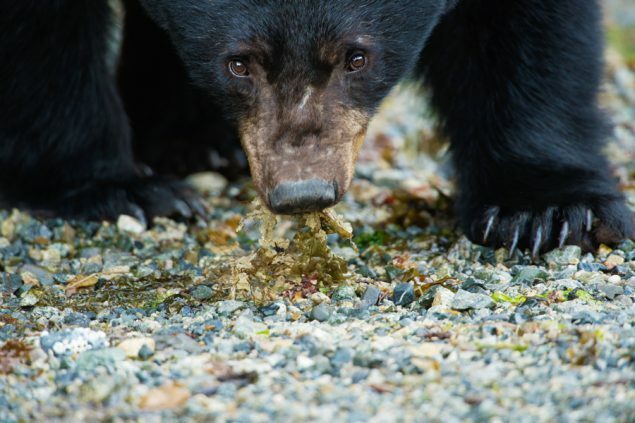 Even bears along the shorelines enjoy the herring roe-covered kelp and eel grass. “We fasten hemlock boughs upright in the water so they look like waving kelp and the herring lay their eggs on them. Then we peel them off and salt them to preserve them,” says Humchitt. His people also eat spawn-on-kelp, a delicacy in Japan as well, and fresh herring. Today, herring are at a fraction of their former numbers. 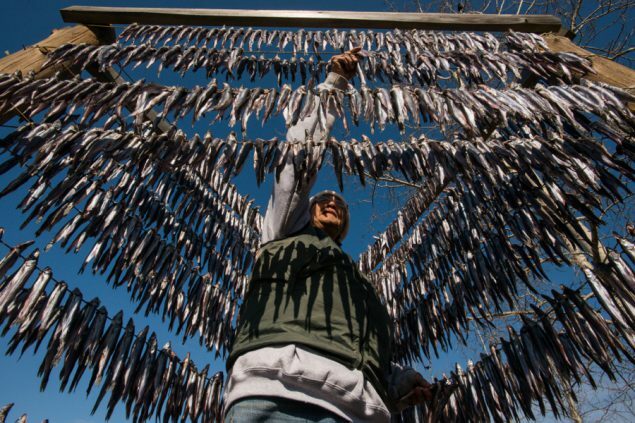 Humchitt says 80 per cent of the spawning areas his people formerly used have vanished because the herring fishery catastrophically collapsed in the 1980s and was shut down. “They hadn’t opened for very long in the ‘80s, but so many boats were taking massive volumes,” says Hegus (Chief) Clint Williams of the Tla’amin Nation located on the Sunshine Coast. After a 30-year moratorium on commercial herring fishing, stocks were finally beginning to show the first weak signs of returning in recent years when the Department of Fisheries and Oceans (DFO) announced it was planning a commercial opening in 2015. A northern sunstar and freshly laid herring eggs in the Great Bear Rainforest. Photo by Ian McAllister / Pacific Wild. Alarms went off up and down the coast. The Tla’amin Nation served notice that they would take action to halt any commercial herring roe fishery in their traditional waters. In March 2016, the Heiltsuk Nation also protested by peacefully occupying the local DFO office for three days. Finally, government policy makers backed down and both groups are now working together on joint management. “It is still too soon,” says Williams (of the Tla’amin Nation). 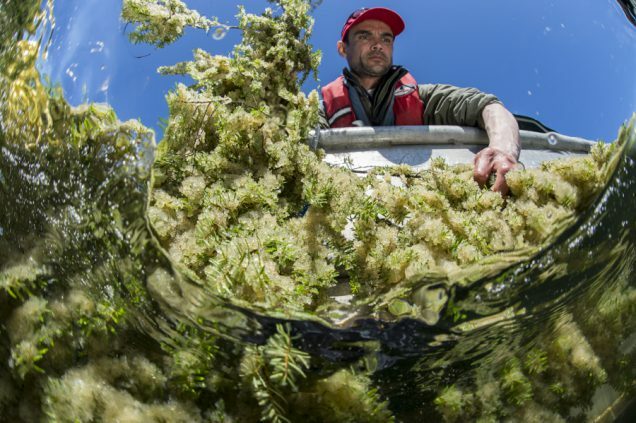 Though eulachon stocks are down, too, there is no commercial fishery and the fish are predominantly taken in the traditional way by First Nations like Northern B.C’.s Nisga’a, for whom they were historically a survival tool. To this day, before the eulachon run every year, seven family groups — including one calling themselves the Dirty Dozen — set up camps along Fishery Bay on the Nass River, about two hours north of Terrace, to fish for the entire community. As the waters turn silver with schools of six- to eight inch-long eulachon, the men drive wooden poles into the rushing river bottom to anchor their funnel nets or cut through ice to reach the fish. For three to four intense, backbreaking weeks, the men work around the clock filling huge wooden bins with fish to ferment and then cook. Once the bins are full, fishing ceases so that the eulachon can continue on their spawning migration. Each of these seven family groups processes about six tonnes of fish, with women stringing together and drying or smoking many of the whole fish. The precious golden oil that makes up almost 20 per cent of the smelt-like fish’s body weight is extracted and cooled into tubs of white grease, a delicacy used today as a condiment. As well, it was a valuable trading commodity transported in airtight cedar bentwood boxes on sleds along a vast network of “grease trails” that in the 1700s stretched from the Fraser River to Alaska and even crossed the Northern Rockies. “In some places the routes have been worn down for so many centuries they are a five foot-deep rut,” says Nyce, from Nisga’a Fisheries and Wildlife. 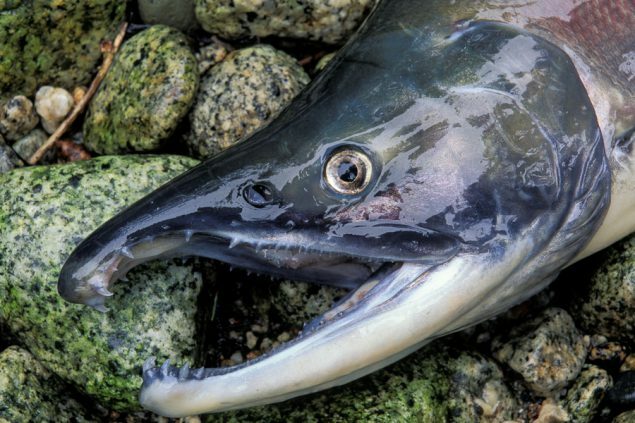 Like many coastal First Nations, the Nisga’a are blessed with their access to salmon, herring and eulachon, the traditional holy trinity of survival. The Nisga’a people, explains Halapija, are still strongly connected with their land. The Adams River salmon journey moved me so deeply as a youngster that experiencing the eulachon migration and the ancient — and still very much alive — riverside processing ritual has long been at the very top of my bucket list. Like salmon or herring runs, it offers a chance to reconnect even the most urban soul with nature’s complex calendar and to witness a traditional way of life that is intimately entwined with the earth and its fellow beings. Editor’s note: This post was produced in an arms-length collaboration with Aboriginal Tourism BC — an excellent resource for Aboriginal tourism experiences located within British Columbia. Many thanks to writer Margo Pfeiff, and to photographers Ian McAllister and Paul Colangelo for their contributions. Our Scottish Father, William Strachan, would have loved this story by Margo Pfeiff. He was a Fisheries Inspector (in Prince Rupert, B.C. ) in charge of the spawning areas of the lower Skeena River in the 1930’s 40’s and 50’s for approximately 29 years. He was keenly concerned about conservation “always alert to the necessity of ensuring sufficient spawners on the Skeena tributaries – one of his biggest concerns was the nylon net…” He was part of an important herring investigation conducted by the Department of Fisheries. My sister, Margaret and I, grew up hearing names of places like Oona River, the Ecstahl River, Kitwanga, Kitwancool, and Kispiox. The Nass and its eulachons became a permanent part of our memories. This is a wonderful story accompanied by exceptional photographs. Thanks ever so much Margo Pfeiff, Ian McAllister and Paul Coangelo. Thanks, Margo, for this story. I learned so much. And I want to learn more.